Includes: Supply lead for battery charger, BT51 Operating instruction book, DH1-C Two wire, four terminal duplex twist probe lead set - 3m. 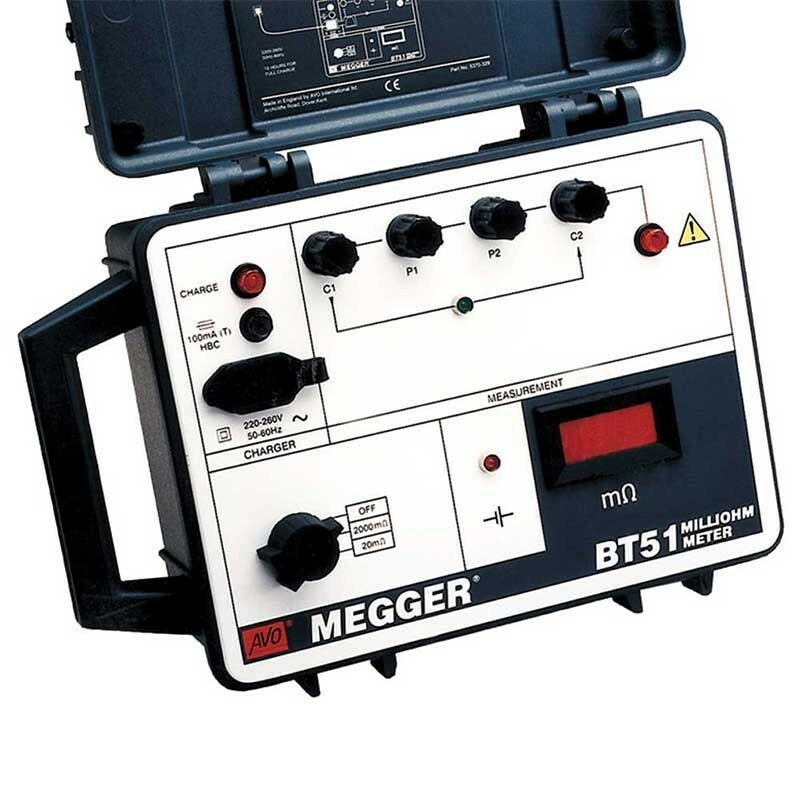 The Megger BT51 Low Resistance Ohmmeter makes measurements by passing a current through the conductor under test and also monitoring the voltage across it. The test current is limited by a simple current limiting circuit and is measured by monitoring the voltage across a resistor. The test current is maintained at a nominal 2 A, and as the measurement is ratiometric, the reading is unaffected by any current variations. Operation of the Megger BT51 is simple, there being only one range switch to set. Power is supplied by internal rechargeable cells and the charger unit is incorporated into the case. The instrument is built into a robust, portable case that is weatherproof and shockproof and has a hinged, detachable lid. 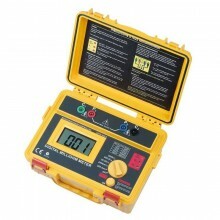 The Megger BT51 ductor uses the four-terminal method of measurement. 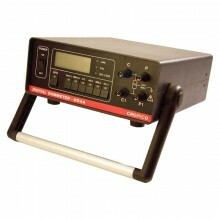 The main advantage of this method is that the resistance of the test leads is not included in the measurement. This is an important factor when the value of the measured resistance is very low. In the diagram, resistance RX is measured only between points A and B; other resistances in the current loop either side of A and B are ignored. Commissioning and maintenance of substation equipment). Maintenance of overhead transmission lines, where “hot” joints can be tested before and after their remaking or recompression. Bond testing aircraft frames, including the bonding of electronic dischargers and fuel tanks. Testing earth bonds in mines. 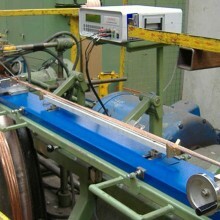 Rail bond testing, where a rail is used as part of a communication system or for power transmission. Testing the integrity of lightning conductors. High test current – 2 a.c. 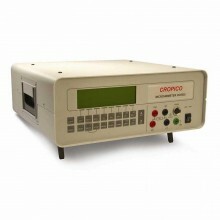 (e.g., for aircraft bond testing). Two measuring ranges (2000 mΩ and 20,00 mΩ) and maximum resolution of 0,01 mΩ. 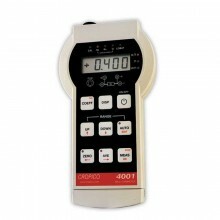 3½-digit LED display, which is helpful in a poorly lit environment. Protection against 240 V a.c. and warning lights for added safety. Robust, shockproof, weatherproof, portable case. 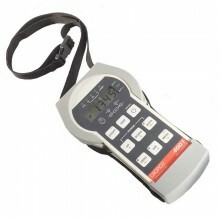 Can use very long test leads. 20,00 mΩ, resolution 0,01 mΩ. 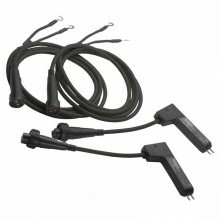 Test Current 2 A nominal, with up to 2Ω across the C terminals. Accuracy (0 to 50°C) ±1% of reading ± 2 digits. Display 3.5 digit LED display. 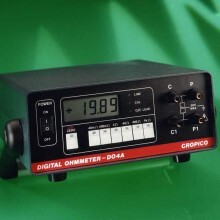 Operating Temp 0 to 50°C (32 to 122°F). Storage Temp -20 to +50°C (-4 to 122°F). 100 mA (T) fuse, 20 x 5 mm, ceramic (for charging circuit). 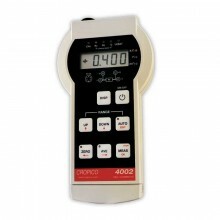 Normal charging time of 10 hours on 240 V, 50 Hz mains supply. 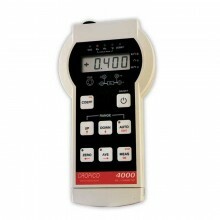 Safety The instrument meets the requirements for IEC 610101-1. (9,6 H x 13,5 W x 6,25 D in. approx). Weight 4.5 kg (10 lb approx). Megger BT51 warranty 2 years. 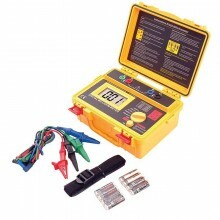 PDF Datasheet of the Megger DLRO Test Leads Fitted with Duplex Connectors options. 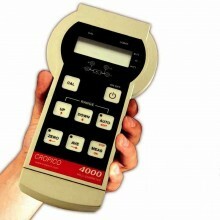 PDF Specifications of the Megger BT51 Low Resistance Ohmmeter.